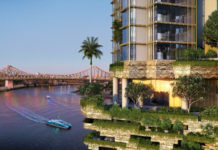 A new DA has been proposed by 359 Queen Street Unit Trust for the further activation of Eagle Lane in Brisbane’s CBD. According to the DA, the refurbishment will include the introduction of Ruby’s Diner, a well known American 1940’s themed restaurant best known for it’s Huntington Pier Diner in Orange County, California. If confirmed this will be the first official Ruby’s Diner outside of the United States. The proposal also includes a tenancy for a Cuban-style bar. This is the second expansion of the laneway after the arrival of Brooklyn Standard, a New York style underground live music bar. 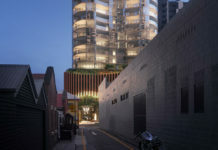 Conveniently named after America’s national emblem, Eagle Lane’s newest expansion plans continues the laneway’s American flavour of restaurants and bars, creating what could shape up to be Australia’s first America-town style laneway. New wall graphics (in effect additional public art) at the building edge. Tenancy names are subject to future confirmation and advertising signage will be obtained separately from Council. Bi-fold operable windows overlooking the laneway and generating a visual (as well as aural) connection between the laneway and the American Diner. New external lighting treatments to the face of the building to optimise laneway safety and security at night-time. A dedicated entrance to the American Diner and Cuban-style bar from the laneway. New climbing (vertical) landscape treatments over wire screens to conceal existing and proposed service units. New paint finish to the building. The ground level of the development fronting Eagle Lane which will house the new Diner restaurant will include operable glazing which will overlook the laneway with direct access to the laneway. The diner will utilise the floor area removed from the rear of the two existing tenancies fronting Queen Street. Ruby’s Diner will comprise of approximately 87.5 square metres of the ground level of the building (existing gross floor area) and is accessible via a new entry doorway from Eagle Lane. Access to the premises is also achievable from the internal lift lobby from Queen Street. Bi-fold windows are proposed along the Eagle Lane frontage of the premises to improve visual permeability within and outside of the building, and to generate a sense of activation along the laneway. 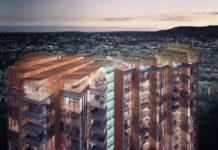 The proposed development also involves re-use of the existing basement car parking space for a Cuban-style bar (Hotel), with associated facilities and function area of 201m2. All existing car-parking is to be removed from site. It is proposed that access to the bar will be provided via stairs from Eagle Lane and lift access maintained from the lift lobby connecting to Queen Street. Images supplied by PDOnline. The DA number for this development is A004257202. I am not keen on the Ruby’s American Diner, when ever someone mentions laneway activation like the nifty laneways throughout Melbourne they have my full support. Although I don’t like the look of the Ruby’s American Diner, I believe that it will look very ugly and out-of-place, Brisbane is undergoing a hipster cafe revolution – not an ugly American Diner revolution.